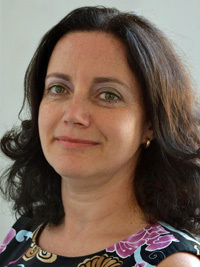 Betty Bonnardel-Azzarelli graduated as a rocket scientist, and today she is managing director of AB5 Consulting, an SME specialising in high technology sectors, including satellite and nuclear, which supports companies, countries and international organisations to develop innovative solutions to help us all live better. She has extensive international experience in the aerospace, satellite, energy, nuclear, transport, and defence industries, for both public and private sectors. Betty is expert in regulatory management, highly complex and technical project / programme management, contract and bid management, change and risk management, as well as business development. My interest in the space sector started when I won a telescope in a draw. I was a teenager and immediately loved looking at the sky, observing the beauty of stars and planets, becoming curious about our universe. To further my knowledge in space, I studied two masters in aeronautical and space engineering at university, developing a passion for finding solutions to complex systems, in particular rocket science, key to access to space. I worked on scramjets, which are a very progressive type of engines, in projects with the European Space Agency (ESA), Dassault and NASA. Systems engineering offers opportunities for varied roles and sectors, always looking at the big picture, making subsystems work together within the environment. At the beginning of my career, I managed an Earth observation satellite, Helios, then I went on to lead the tendering process for the procurement of important air defence systems for a frigate for the Ministry of Defence. When I was approached to work on the nuclear fuel cycle, I took the challenge! Space and nuclear have a lot in common, and the same engineering principles apply whatever the sector. I really believe in the importance in continuous learning and throughout my career, I studied a MBA, project management and a nuclear law degree. I am now managing director of AB5 Consulting, an SME I founded, which aims to develop innovative solutions to investigate new markets. We conduct feasibility studies, support regulatory developments, help businesses work across sectors. This is a very exciting new challenge where I have to use my engineering knowledge combined with business skills. My days vary greatly as I manage AB5 Consulting. I travel a lot, to a large range of countries, such as Switzerland, Denmark, France, Kazakhstan, USA, UAE, representing clients at international regulatory meetings, training people, participating in conferences or pitching for new business. I also attend a lot of meetings in the UK. I usually spend a lot of time in calls, or in web meetings, with international teams located in various parts of the world. I work on feasibility studies, system assessment, position papers, strategy analysis, and draft reports. I also address the people, administrative and business management of my company. This last part is not necessarily my preferred one as it can be quite time consuming and requiring knowledge I need to learn, but it is very important to develop and grow the business. As a systems engineer, I can work on a vast range of sectors. I am very curious and enjoy engineering in general. There are many industries which l find very exciting, but it is true that the space sector is one of my favourites. My early encounter with astronomy arose my curiosity about what’s up there, while at the same time, space holds a lot of clues about the origins of our planet. Also, there is something magical about going to space. It allows us to watch down on our planet earth with a totally different perspective, more global, and realise the relative impact of mankind on earth. Satellites can help our daily lives, from weather forecast to internet connectivity, from agriculture to TV, from disaster management to asset management … space sustains so many other industrial sectors. At the moment, a lot of disruption is happening in the space sector, with stronger emphasis on commercial activities. This is accelerating the development of the necessary technologies, and bringing a more pragmatic view of the space sector. The current level of innovation is so motivating, creating new opportunities in all space sectors, including satellites and launchers. I also like the fact that the sector is international. Due to the level of investment, and the breadth of knowledge required to build and launch a satellite in space, not many countries have the capability all in their engineers. Thanks to my career in the space sector, I have met amazing people and great friends all around the world. The space sector, like all other high technology sectors, has a small representation of women in engineering and science. A better representation exists in administrative roles and in support activities, but there is not necessarily a good representation at senior level. Women make up 50% of UK population. Yet, last month’s publication of the Engineering Council report shows that women only represent 5.2% of engineers and technicians listed on the Engineering Council register, while the Institute of Engineering and Technology (IET)’s 2016 Skills & Demands in Industry Survey reported that “women still account for only 9% of all engineering and technology employees in the UK, gender diversity remains a huge challenge for the sector”. As international organisations and government agencies are becoming more aware of the issue, there is a potential opportunity for change being created. For this change to materialise, a lot of energy needs to converge quickly, with the buy-in of every male colleague at each organisational level. This energy needs to be captured by companies and universities, which need to be more pro-active into looking to achieve a good gender balance. This is probably easier with larger organisations where a “diversity manager” will be hired, but it is much more difficult to achieve for smaller organisations, struggling to understand what they have to do on this topic. More mechanisms should be put in place to support these small and medium sized enterprises (SMEs) – helping them to find female talent, training it to the needs of the company, and developing these talents at all levels. This is critical as most of the workforce is typically employed by SMEs. 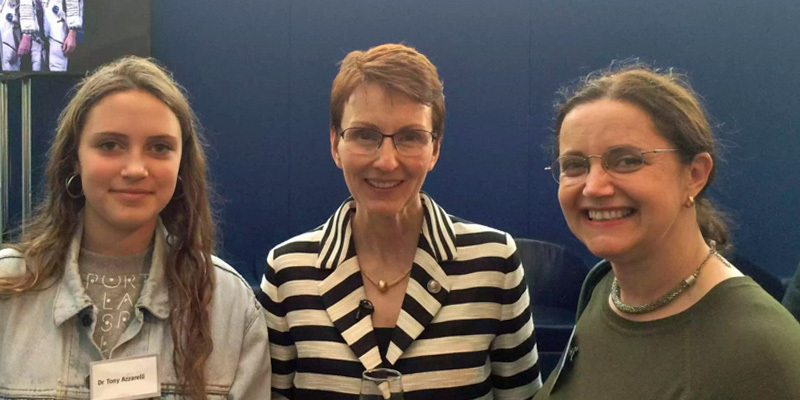 Last year, I had the pleasure to meet Helen Sharman, who was the first Briton in space and the first woman in the Russian MIR station. (See main image.) She went to space in 1991. The second British astronaut is Tim Peake, who went to space last year in 2016, 25 years later. I have great hope that we won’t wait 25 more years to see the next Briton in space as the space sector is gearing up for a whole selection of new commercial activities, including space tourism. Twenty-four years ago, when I first heard about space tourism at the International Space University, it seemed like a distant dream. However, thanks to technological advances, and reduction in cost for accessing space, space tourism is around the corner. It will soon be possible to get a flight in space as we fly an airplane. I really hope that access to space will soon be equal for both men and women. 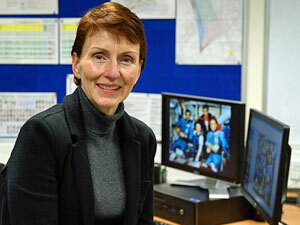 I hope that women will be pilots of space ships, as well as passengers. I hope that a base on the Moon or a trip to Mars will see equality of representation of genders, in terms of engineers designing and preparing the mission, as well as in the numbers of women astronauts. I hope also that soon many more women will be working in the space sector in every discipline, that women working in space would not sound special anymore. I graduated in engineering 25 years ago, at a time when the gender balance stood at almost 15%. A few years ago, I was shocked when I realised that the gender balance was often much lower than 10%. While women are now well represented at entry level in areas such as medicine, it is not the case still in most of the science, technology, engineering and mathematics (STEM) matters. This needs to change in a sustainable manner and at all levels of organisations. At the time, I was working for the nuclear sector, therefore I decided to found Women in Nuclear UK, together with other like-minded women, and I became vice-president. We worked on three pillars, attracting more women to the sector, retaining those talent in the industry and promoting dialogue on nuclear with the public. I realised there was a real need for such an organisation as membership grew very quickly. We had a strong strategy and develop concrete actions to support awareness, combat the perception bias, and help organisations improve their gender balance at all levels. As I finished my term, I left the organisation last autumn, but I am so pleased to have met amazing friends. As I saw the very low figures for gender balance in the STEM subjects, and as I am working in engineering, I want to do more to influence change. I am a member of the Women’s Engineering Society (WES) Council and I sit on the Board of International Women in Engineering and Science (INWES) Europe. I am a great supporter of these organisations as we work together on concrete actions aimed at making a difference. WES’ MentorSET scheme is a good example of a strong mentoring programme, and through INWES, we can identify successful actions and replicate them throughout Europe. I think however there is still so much to be done, as change needs to happen at all levels, for girls in school at a young age and all along their education, at entry level and supporting women through their career, developing schemes to retain their talent, supporting women returners and helping those aiming high to break the glass ceiling. We really need to achieve a critical mass in order to achieve a sustainable change in organisations, and in people’s perception. Engineering is about solving problems in a creative manner. This can only be achieved efficiently by teams, who can use each individual experience to think outside the box. More and more, our world is dependent on engineering and technology. From driverless cars, to satellite-based agriculture, from the use of smartphones to artificial intelligence, science, engineering and technology is everywhere. Thus, we live in a world where innovation is vital for the survival of businesses, as technologies can change so quickly. Without an agile way of thinking, it is impossible to create and implement those necessary changes. Innovation is there to improve our daily lives, and the lives of others, all around the world. For all these inventions to benefit us fully, diversity in society must be reflected in science and technology. Equality in representation of women in engineering and science should be the norm. This will take time to be achieved, but wherever possible all efforts should be made to make it happen. Diversity is also important at C-level, where strategic decisions are made on businesses. As women seat at the top table, they bring a different perspective to their male counterparts. They also act as role models for the younger generations. As I manage AB5 Consulting, I face the challenge of gender balance every time I set up project teams. For instance, the European Space Agency tender I won last year, included a team of seven technical experts, three males and four females. The team was not balanced by design, but because of my acquaintance with a lot of talented women through my work and my involvement with WES and INWES, it was a natural choice for me to include them in the team, without thinking about their gender. I also try to ensure that gender balance is observed in panels and conferences. I really think more efforts should be made and more women should be encouraged to deliver presentations, as I really think that it is more a question of dedicating time to look for female talent than anything else. I am on a mission to develop AB5 Consulting further, and that is taking a large portion of my time and objectives. I am very proud of the achievements so far, with the contracts signed, the projects being developed and the high calibre experts who are supporting the work I am trying to achieve through the company. I am also working on new start-up projects, in space, education and tech, which I hope will see light in the near future. I am actively working with WES and INWES on the representation of women in engineering and science, and I hope that my contribution alongside these of other passionate women, will implement a sustainable change.